Awhile back we were given a couple of nice quality end tables that a couple of our girls used as night stands for awhile. When they moved on to other room arrangements, I wasn’t sure where else they would fit in the house. I knew I’d need more end tables at the beach house, but I was concerned that the dark wood was a little outdated and not ‘beachy’ looking. But then I spotted an adorable chalk paint makeover on Pinterest that turned out to be the perfect update. I’m terrible at getting ‘before’ pictures with my projects since I usually just leap in. But here’s a picture of the project in the early phases. The table on the left has been lightly sprayed with plain old spray paint. The one on the right shows the original color of the tables. 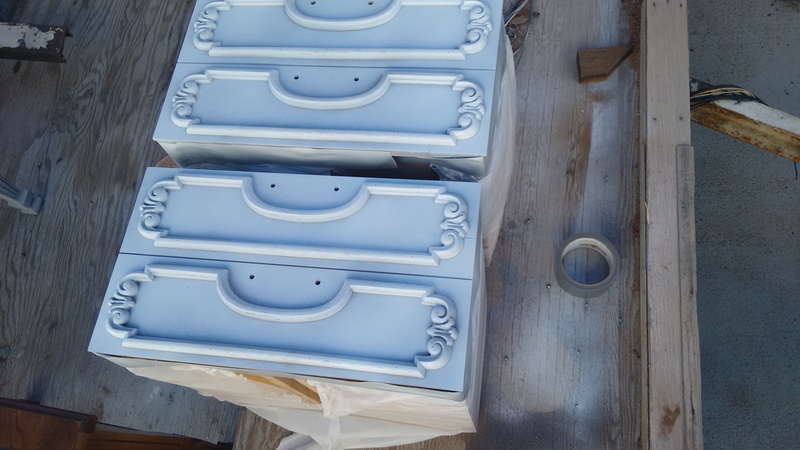 Here are the drawer faces with white spray paint on them. Something about the lighter color made the details pop in a new and fresh way for me. I did zero prep of the wood before spraying them, except for sticking each drawer in a sack before painting so that I wouldn’t get over-spray inside the drawers. Here’s one of the drawer faces after paint. Isn’t the blue sweet? It is a 50/50 combination of Junk Monkey Teal River and Sherwin Williams Dover White. To paint the table itself, I started out with it upside down. Since the legs and sides have so many crevices and details, that took a little while. When that first coat was dry, I turned each table top side up so I could paint the tops, and also touch up any bits that I missed when painting the legs the first time around. Then as a finishing touch, I spray-painted the hardware a crisp black before I put it back on the drawers. It had been a bronzy brown before. I really love the way the black hardware pops against the turquoise paint. If I wanted to, I could lightly sand the edges of the pieces to give them a distressed look. But for now I am just enjoying the pretty surface. 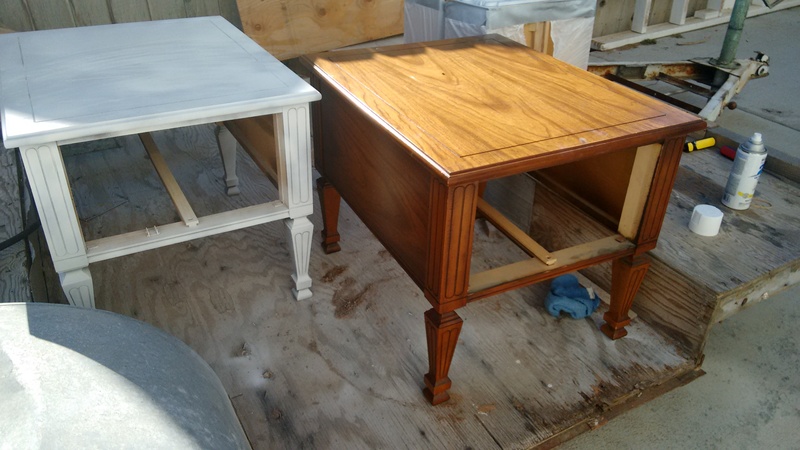 I do plan to wax the dressers before bringing them over to the beach house to give the finish more durability. 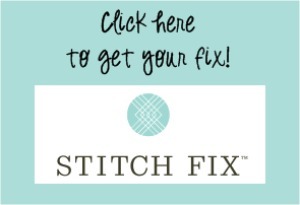 This project was so much fun to do that I have an old dresser on my list to try next. Most likely it will also be headed for the beach house. Fun!! Gorgeous! 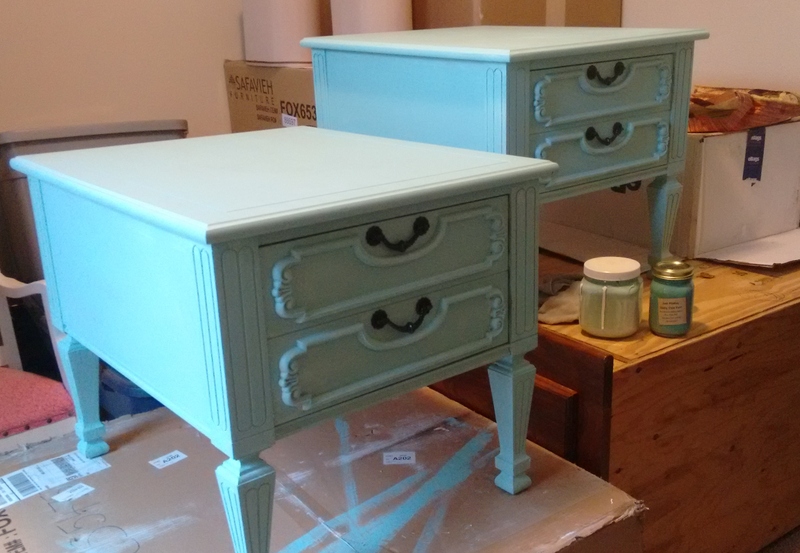 Love the look of chalk paint! very pretty! It’s a great color for the beach house. I painted the top of an old coffee table with black chalkboard paint — my younger kids love being able to draw with chalk in the winter! I didn’t know about the no-sanding . 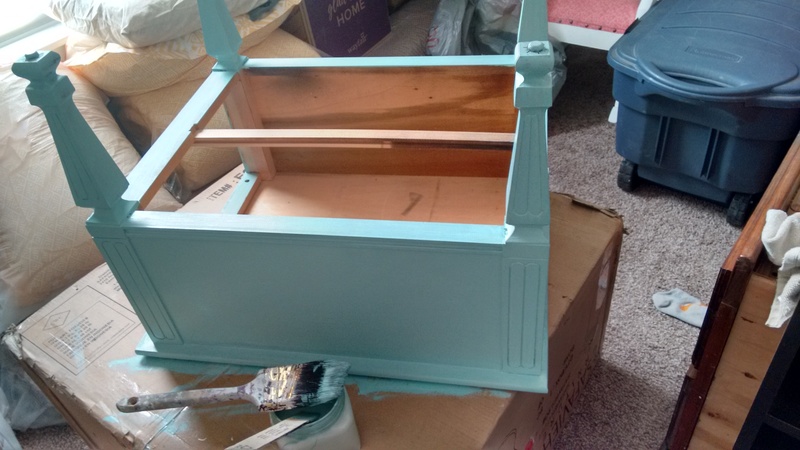 . . but I wouldn’t have wanted to go to the trouble to tape off & spray paint the top (it has an outer trim that we kept in its original finish). Love the color with black handles! 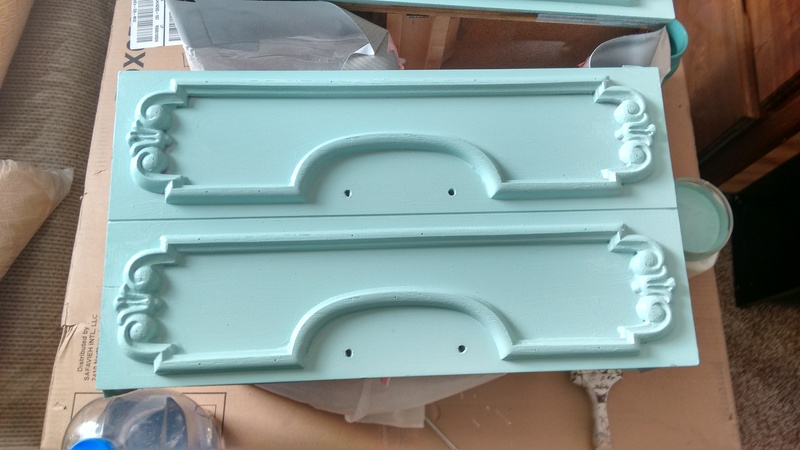 Black hardware on turquoise paint – excellent choice!